Tokyo – Atrial fibrillation (AF) is a heart condition that causes an irregular, and often rapid, heart rate. It increases the risk of developing strokes, heart failure, and even dementia. Although it can be associated with aging, high blood pressure, diabetes, heart valve problems, etc, about one-third of patients with AF have no symptoms until they suffer a stroke. Therefore, a means of identifying or predicting AF with the aim of starting preventative therapy is highly desirable. AF is associated with several factors that maintain its progression, including inflammation, electrical disturbances, and structural changes in the heart's upper chambers (the atria). Moreover, several different short sequences of RNA known as microRNAs (miRNAs) have been linked with AF pathology. miRNAs control gene expression after the transcription stage, and have been suggested as possible markers for some cardiovascular diseases because of their stability in the bloodstream. However, it remains unknown whether the miRNAs shown to be related to AF are suitable as predictive biomarkers of disease. 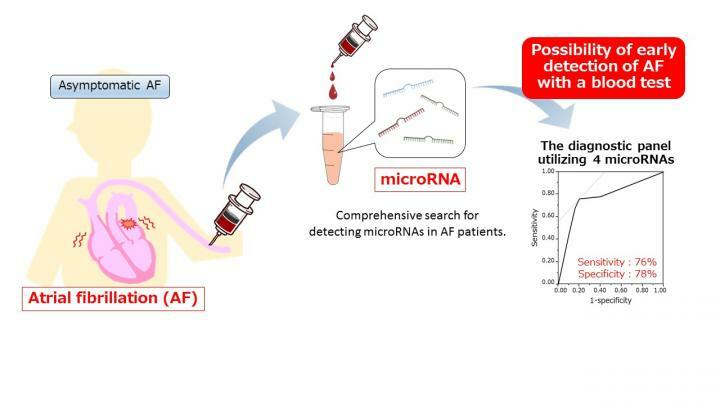 A team of researchers from Tokyo Medical and Dental University (TMDU) addressed this issue by comparing miRNA expression in AF patients and healthy controls, and between control mice and those with a similar abnormal heart rhythm to AF. They showed that four miRNAs not previously associated with AF were significantly upregulated in the serum of AF patients and diseased mice, indicating their potential use as AF biomarkers. The study results were recently published in Circulation Journal. Initially, human serum and mouse atrial tissue were screened for 733 and 672 miRNAs, respectively. These were eventually narrowed down to four by excluding non-detectable and non-specific miRNAs, and focusing on the quantification of their expression. "One of the miRNAs, miR-214-3p, is implicated in inflammation, so we wondered whether this might be the underlying mechanism of miRNA-induced AF pathology," first author Yu Natsume says. "We compared miRNA expression with levels of a serum inflammatory factor but found no correlation suggestive of an association." Statistical analysis of diagnostic ability showed that miR-214-3p and miR-342-5p had the highest accuracy as individual biomarkers at predicting AF, but that a combined analysis of all four miRNAs slightly improved this accuracy. "The same two miRNAs showed increased expression in a subset of patients with intermittent AF and another subset with chronic AF," corresponding author Tetsuo Sasano says. "The increases were in comparison both with healthy controls of the same age and young healthy controls, suggesting these miRNAs may predict AF regardless of the age of the individual." The researchers propose additional studies to determine the functional role of the identified miRNAs with respect to AF.